How far would you go for a plant you’ve never seen? I might invest a season, or two, trying a new plant. But dedicating most of my adult life to a plant I’ve never experienced nor likely will, probably not. Thankfully there are people out there who will. The American chestnut tree (Castanea dentata) once dominated our eastern forests. Standing over 100 feet tall, these mature trees towered over the landscape. Looking across the Durham horizon the tallest thing I see is a cell phone tower. It’s over 100 feet tall and dressed up to look like a pine tree so I try to imagine a chestnut tree in its place. The disappearance of the chestnut tree is painful because we caused it. In 1867, plantsman S.B. Parsons imported the first Asian chestnut trees to New York. Along with those trees came a fungus. Co-evolution had allowed the Asian natives to develop a resistance to the fungus, but our American chestnuts were vulnerable. Parsons unknowingly sold the infected trees throughout New York and Connecticut. Other nurseries began offering European, Japanese, and grafted trees for sale through mail-order catalogs and 23 years after first arriving on our shores hundreds of acres of chestnut trees were being grown at locations in New York, New Jersey, and Pennsylvania. Five years later, in 1904, the first case of chestnut blight was detected and identified at the Bronx Zoo in New York. Just two years later growers realized the fungus had spread and was killing American chestnut trees as far away as Virginia. Hoping to create a firewall around the outbreak millions of American chestnut trees were cut down in New York and Pennsylvania. A generation later American chestnut trees had vanished from sight. Contrary to popular belief the tree is not extinct, but rather clings to life hidden in our forests today. The fungus causing the chestnut blight kills the tree but leaves viable roots in place. Across the tree’s native east coast range chestnut tree roots send up sprouts that can live for a few years before succumbing to the blight. But decades of tireless research to breed blight-resistant cultivars are coming to fruition and now test trees are being planted across Appalachia. Leading this effort is the American Chestnut Foundation. The Foundation, Boy Scouts, Master Gardeners, and other community volunteers have planted test plots of blight-resistant American chestnut trees in dozens of locations across the Carolinas. Volunteers are essential to the foundation’s efforts. Sending in over 2,000 leaf samples a year for identification and testing, individuals help locate chestnut sprouts which are then entered into a location database. Volunteers also help plant trees, monitor test sites, and help with outreach efforts. While I may not have the space to plant a chestnut tree in my garden, the possibility of seeing something taller than a cell phone tower dressed up like a pine tree on the horizon gives me hope. Perhaps we can correct at least some of the mistakes we made in our past. For information about ways you can help, contact the American Chestnut Foundation, Carolinas chapter at ACF.org. 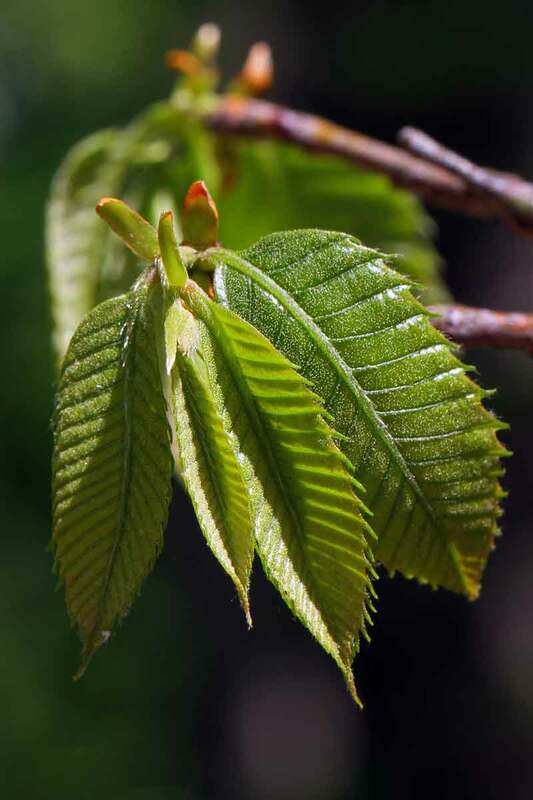 Feature image – American Chestnut tree leaves / American Chestnut Foundation. Dr. Lise Jenkins produces the Triangle Gardener’s podcast. She also volunteers her time as a Master Gardener in Durham.